Not a boat but afloat. Most people want to know their retirement is safe and sure. Also most retirees want to escape to warm climate instead of from warmth to cold. But that is just what they did. Plus their home can only be accessed by boat. What a wonderful home out on the lake. Including a float garden. Los Angeles expats of a certain age Margy and Wayne Lutz took a decidedly unique route when selecting where exactly to hunker down after taking an early retirement from their careers in education. Originally used as portable bunkhouses for loggers and weekend getaways for mill workers in the nearby city of Powell River, float cabins are now popular rental retreats for vacationers who flock to the Sunshine Coast region every summer for a little R&R. Having vacationed in the area a few years prior, Margy and Wayne Lutz weren’t looking for a rustic floating cabin to spend a few summer weekends in. 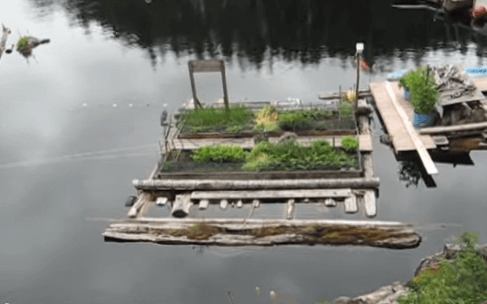 They were looking for a full-time floating residence that would allow them to go completely off the grid. Accessible only by boat, the 420-square-foot home (plus a 200-square-foot sleeping loft) is powered by solar, wind, and thermoelectric energy with some additional help from propane during the winter months. As for the facilities, Margy and Wayne installed a composting toilet within the dwelling after hiking up a granite cliff to use an outhouse provide to be too burdensome. It’s also worth noting that Margy and Wayne lease their “lot” for $500 a year from the B.C. government. Here is a tour of the home and how they live off grid.